Four-time Grammy Award winner and a founding member of Nitty Gritty Dirt Band, John McEuen has assembled a unique cast for a special night to share the music and memories of the landmark “Will the Circle Be Unbroken” platinum album and his incredible 50-year career with the Nitty Gritty Dirt Band. The cast includes: Les Thompson (bass, vocals, bouzouki), an original NGDB founding member; John Cable (guitar/vocals/mandolin) who also toured Russia as NGDB member; and Matt Cartsonis (vocals/mandola/guitar) a 25-year music partner with John. Molly Mason will be joining the band on bass, the legend David Amram will hop on stage to continue showing people his wizardry, and Kevin Twigg (snare and percussion) will be coming too! When John initiated the “Will the Circle Be Unbroken”* album, the icons of bluegrass, country and West Coast country-rock convened: Earl Scruggs, Doc Watson, Merle Travis, Jimmy Martin, Roy Acuff, Vassar Clements and Maybelle Carter. Six hot August 1971 days produced the benchmark record relevant to this day (and it's still on the Amazon Top 30!). All join host John McEuen, with his banjo, guitar, fiddle and mandolin, for hits and stories behind the music, leading us to that magic time when three generations came together. The Library of Congress inducted the multi-platinum “Circle” as one of the most important American recordings (it’s also in the Grammy Hall of Fame). 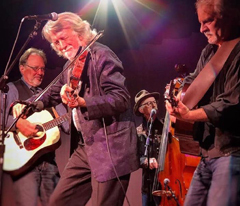 With narrative and music of early NGDB, McEuen takes us on his 50-year journey - interwoven with Dirt Band favorites, hot bluegrass and rare early NGDB music. A unique part of the show covers the 1977 Russia trip, and what happened behind the Iron Curtain to the first American band to tour there – 28 sold out shows. The evening features classic NGDB favorites and music from McEuen’s recent highly praised record, Made in Brooklyn,” on Chesky Records (Stereophile Magazine’s Record of the Month). John was recently inducted in to the American Banjo Museum Hall of Fame (check out www.johnmceuen.com. His first book, “The Life I’ve Picked,” published May 2018, has more than 50 5-star reviews on Amazon.